“ Jordan is an A+ lawyer who will get you the result you want. I was a student who had lived in Miami for 4 years during school and my former landlord was refusing to return a $4,500 security deposit. I had worked hard to maintain the apartment and make sure it was spotless upon moving out. I had been assured by the landlord multiple times that the deposit would be returned to me. I wrote them a demand letter myself, which was ignored. After two months and several attempts at finding a lawyer willing to take my case for a reasonable fee, I was ready to give up. Then by pure chance I ran into someone who recommended I give Jordan Brill a call. His fees were not only reasonable, but his communication was excellent throughout the entire process. He wrote a letter that the landlord's attorney responded to promptly, and immediately offered to refund the deposit. After months of headaches and frustrations I finally have the money I was owed, and my only regret is not finding Jordan Brill sooner. I highly recommend Jordan and his firm for any landlord-tenant dispute, and will absolutely use him again in the future if (God forbid) I'm ever in that sort of situation again. Bonus-- Jordan is also a very down-to-earth guy who is very easy to talk to, which is not common in the legal profession these days. “ I retained Matt Glachman for a highly contentious, somewhat unusual, legal situation. I immediately noticed his quick attention and that he was absorbing the details (and there were many) faster than I would have expected anyone to do. I asked A LOT of questions; all of which he answered quickly and effectively. I was pretty upset throughout this situation, but his competence and calm demeanor were very helpful. He explained to me my rights and courtroom climate, so that I thoroughly understood where I was on solid ground and where it got a little ify for me. I wasn't expecting that, and it was helpful in weighing my options. I found him impressive during mediation, which he negotiated to conclusion. THAT was a feat in and of itself, as I was very resistant to settling. His calm affect does not mean that he's not strong; he very much was a force to be reckoned with. There's a part of me that regrets not being able to see him work in a courtroom. Most importantly, he kept in mind the factors that were personally, very important to me. I am absolutely certain he had my best interests at heart. I highly recommend Matthew Glachman. I recommend that you listen to him, even if he tells you something you don't like (and he may). There is absolutely no debating his competence, but he also brings an intuition of what events you may encounter that I have never before witnessed in an attorney. I hope I won't have future problems, but if I do - he's the only call I'll make. “ Mr. Glachman is a knowlegeable attorney who takes the time to give his clients the personal attention they deserve. He is very responsive and communicates the law in a simple and easy to understand manner. He always answers the phone when I call him. I highly recommend him to anyone looking for high quality representation! “ Glachman & Brill are great attorneys who respected my needs. I have a lot of experience working with attorneys, but these are some of the most honest and respectful lawyers I have ever dealt with. I tend to be a bit �needy� when I have legal problems, so I call frequently and ask for updates. Most attorneys I have worked with take a long time to return phone calls, or only respond via email or letter. Glachman & Brill always returned my calls and answered my questions. I would definitely use them again. 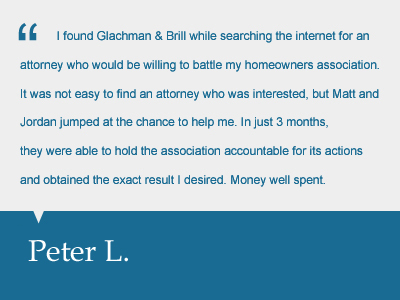 “ I came to Glachman and Brill for legal matters pertaining to business law. The professionalism, knowledge and patience set my mind at ease knowing that my matters were being taken care of. Matthew took the time to explain in detail the things that needed to be done and how he would handle them. I would encourage anyone that has any pending legal matters to contact Glachman and Brill. You will be in good hands. “ Glachman & Brill, P.A. is a wonderful firm for anyone who wants their case handled with personal care and attention. They were fully involved from the moment I retained their firm to the moment my case was resolved. They took the time to go through every detail of my case and were available to speak to me directly anytime I had a question. Mr. Glachman and Mr. Brill provide excellent customer service and I highly recommend this firm to anyone looking for assistance with any type of legal matter. 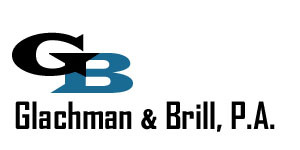 “ Glachman & Brill is an excellent boutique law firm. In my experience they provide reliable and effective representation and they go above and beyond to make sure their clients are happy. I definitely recommend their services. “ Mr. Brill was very attentive, extremely responsive, and understanding. I highly recommend Mr. Brill and the firm.